The U.S. Senior Open was a reunion for several former Ohio State stars that almost ended with one of these Buckeyes being crowned homecoming king. 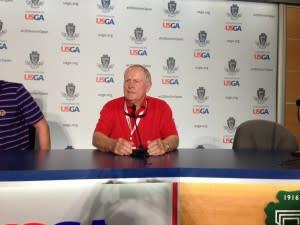 But in the end, Gene Sauers, who overcome a rare and often-deadly disease, won the rain-delayed 37th U.S. Senior Open at the historic Scioto Country Club in Upper Arlington in dramatic fashion. He holed a seven-foot putt on the 18th hole to beat Miguel Angel Jimenez by a stroke on Monday. Joey Sindelar was in contention throughout, leading at the halfway point, and finished four strokes back in a three-way tie for sixth. 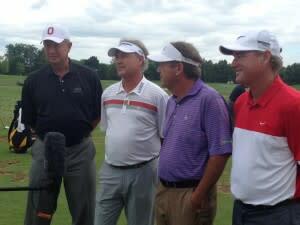 Sindelar and his fellow Buckeyes, John Cook and Rod Spittle, played together on Thursday. Another Ohio Stater, Brian Mogg, also qualified for this major tournament. And, of course, the greatest Buckeye golfer of them all, Jack Nicklaus, spent some time at the course where he learned to play, although the Golden Bear didn’t play in the U.S. Senior Open. “First of all, being with John and Rod today, and, of course, Brian Mogg yesterday, those were just memories flashing through the brain all day … and remind me of, oh, yes, we did this and we did that, all those joyful things,” Sindelar said after Thursday’s opening round in which he shot a 69 on the par-70 course. He shot a 66 on Friday to take a one-shot lead. Double bogeys on No. 13 on the final two rounds sunk his chances. Cook and Sindelar were teammates on the 1979 Ohio State team that won the NCAA Championship. Sindelar was a two-time, first-team All American and has won seven PGA Tour titles. Cook was a three-time, first-team All American and won 11 PGA Tour titles. Any excuse is a good one to return to Columbus, and playing in the U.S. Senior Open is the best possible reason. A close second is to attend a football game at the Shoe, according to these four Buckeyes. Spittle finished at 14-over par and tied for 51st; Mogg shot 15-over and tied for 54th with Tom Watson; Cook missed the cut by one stroke. Another tie that binds these four friends together is their admiration for Nicklaus. The Golden Bear helped recruit Cook and Spittle. Spittle didn’t turn pro until 2004; Mogg played on the PGA Tour regularly from 1986 to 1990 and has been a teaching pro in Orlando the past several years. Nicklaus talked about how he took up golf after his father broke his ankle and underwent three operations. The answer was yes, and the rest is golf history. The PGA Championship was held at Scioto in 1950. Nicklaus was 10, attended and got autographs from Sam Snead and Lloyd Mangrum. Jack broke par for the first time at Scioto when he was 13. Thirteen! Another memory is making two birdies on one hole, sort of. “I remember hitting my second shot and hitting a bird in the air, (the ball) dropped down and I knocked it on the green and made another birdie,” he said. We could listen to Jack tell golf stories all day. It’s like listening to Picasso talk about painting or Edison discussing how to invent stuff. Jack’s greatness and his Memorial have helped make Columbus a golf destination. “There’s got to be more high-quality golf courses in Columbus per square inch, or per number of golfers, than (anywhere else) in the world,” Mogg said. “You could spend a week here and not get it all done,” Cook added. Hey, come to think of it… they did.